Students returning to campus may have noticed significant advances in various construction projects throughout Main Campus. The scaffolding has been taken down around Alter Hall, and Presser Hall will soon see a new atrium. 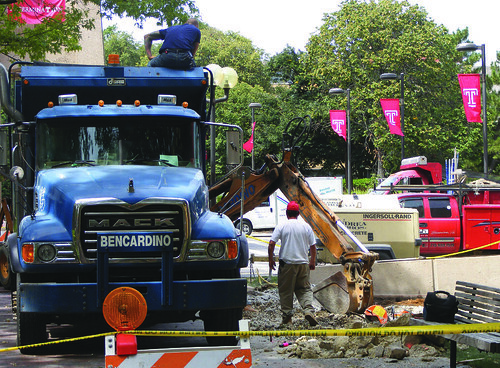 Construction crews have been working all summer to finish several projects around campus (Tim Bennett/TTN). With many of these projects nearing completion, The Temple News outlines what has been accomplished and what students, faculty and staff will still be waiting for. After many rumors that it would be demolished, Temple Towers, a 680-bed apartment complex, is here to stay. To accommodate the increasing number of students living on campus, Temple Towers is being remodeled and renovated. “We are not knocking Temple Towers down. We are going to do a complete renovation,” said William Bergman, vice president for operations. Electric and water lines were updated over the summer and major construction overhauls will take place next summer. One of the biggest changes to the apartments is that the balconies will be removed to extend room space. New kitchens and bathrooms will be installed. Bergman said the lobby of the building will also be revamped. With the Tyler School of Art moving to Main Campus, art students can create and display their work in a new building designed by Texas-based architect Carlos Jimenez. At an estimated $76 million, the newly designed Tyler and high-tech equipment will become the premiere art school in the Philadelphia area, Bergman said. The state contributed $61.5 million to the construction. The new facility will be home to a sculpture garden, which will be the largest green space on campus. In addition to the $4 million renovations to the Louis J. Esposito Dining Hall, the rooms in J&H underwent a makeover. Bergman said over the past two years, all new furniture and air conditioning units were installed in the rooms. After J&H’s being one of the less popular dorms, Bergman said students are now excited to live there. “Alter Hall is this grand building that is going to be home to the business school,” Bergman said. Speakman and Alter halls will be connected to allow students to fully utilize the new space. The new business building will have the largest stock ticker room of any university in the country, Bergman said. “Temple’s business school is offering a modern, today education and the building shows that,” Bergman said. Eighteen months of construction will pay off when Alter Hall opens for classes in the spring semester. Alter Hall cost an estimated $80 million, with $25 million donated from the state and approximately $20 million from private donors. Six Tyler students and alumni put together this weekend’s Rock Bass Rainbow Fest.